As a Salesforce Administrator, it’s important to understand the basics of the salesforce.com URL. The better you understand the URL, the better you’ll be able to leverage it to give your users a better experience. Before I begin, I need to make it clear that Salesforce does not support what you’re about to see. Please do not contact them for help and expect support for what I’m about to show you. The Server Instance: This represents the server your Salesforce data is hosted on. Salesforce is frequently adding servers so these numbers are always increasing. The alpha portion of the instance represents a global region, while the numeric portion represents the server number. If you use a custom domain, you’ll see your domain name here. The Object Code:The first three characters represent the object the Id belongs to. In this case it’s “001”, which means this is an Account ID. The table below is a quick reference of the most common objects. The Pod/InstanceIdentifier: This two-digit value represents the server instance the ID was generated on. There are a series of numbers here that link back to the server instance. We could have a separate discussion on this, but its not relevant for our purposes at this time. Reserved: This single digit value is reserved for Salesforce’s use should it ever be needed. I’ve never seen it be anything other than a zero for now. ID: The next nine digits makes your record unique from everyone else. Not shown in the URL, is an additional three digits that makes the ID case insensitive. Anytime you reference the 15-digit record ID, you must keep the capitalization the same. If you use the 18 digit ID, the capitalization doesn’t matter. Now that we understand the makeup of the URL, lets explore some fun things we can do with it. By editing the URL as shown below, different pages will appear. 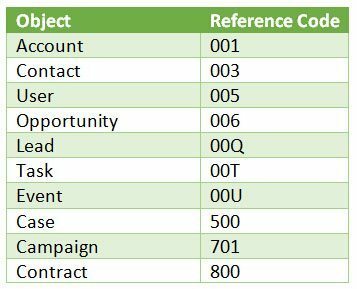 https://na11.salesforce.com/001/o will display the overview page for the Account object. This is the same as clicking on the Account tab. https://na11.salesforce.com/001G000000q0Ipg/e will display the Edit page for the record ID shown in the URL. This is the same as clicking the Edit button on a record. retURL: This tells the Edit page what page to display after you save or cancel the edits. clone=1: This is the same as pressing the Clone button when viewing a Detail page. followup=1: This is specific to a Task record and will tell the page to display a follow-up task in addition to the typical Task record. So, you get two Task records on one screen. IsReminderSet=1: When this parameter is set to 1 the Task Reminder checkbox is marked. If it’s set to 0, then it will be disabled. When using parameters, the very first parameter will be prefaced with a “?”. Then any additional parameters will be separated with a “&”. Sometimes, you’ll see “%2F” in front of a Salesforce Record ID. “%2F” simply denotes how a browser sees a “/” mark. I’ve always been able to remove that indicator when building custom URL buttons, but if you’re having trouble, you might try using this technique. For more information on how to create custom buttons, see my post on URL Hacking for Salesforce Automation. Have fun trying things in the URL line on your browser and see what happens. As you learn more about the URLs, you’ll be able to create button and links to simplify processes for your users.